On June 3, I cooked a hamburger (iron!). Considering how rarely I cook, this almost counts as an achievement in itself. :P Good thing, too, because I didn't do much else. I was crashing from the caffeine buzz of migraine meds and went to bed super early. On June 4, I made some clothing repairs. I'd caught two of my skirts on my New Rock boot buckles and ripped the lace. Typical goth problem, right?! ;) So I stitched the lace back on. I also replaced "sprung" elastic in a waistband and completed an unfinished skirt by adding lace at the hem. On June 5, I continued with sewing projects. A while back, I'd made a skirt with a new pattern, and the waistband turned out wonky. So I pulled out the elastic, restitched the waistband, and re-inserted the elastic. Then I re-hemmed the skirt, adding lace trim. 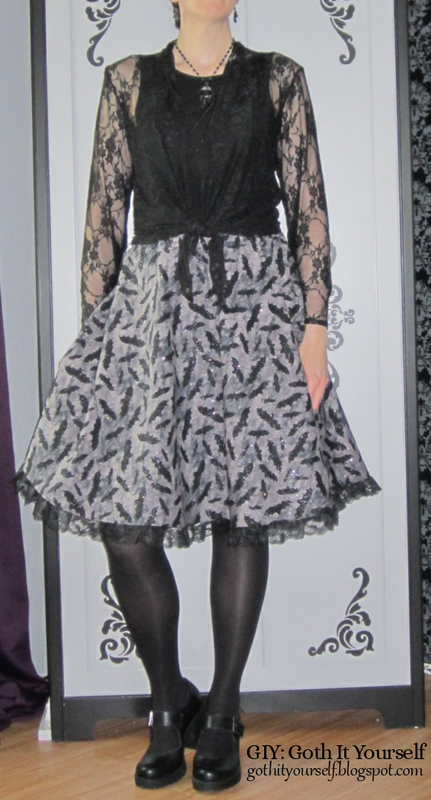 Now I'm happy with the skirt, which is made from a glittery bat fabric. EDIT: I got a few queries about the fabric. I bought it at Jo-Ann; looks like it's still available online. Five skirts put back into active wardrobe rotation... Done! Thanks! I love the fabric; I can't believe I let the skirt languish unworn for so long. What pattern did you use for the skirt and are you wearing a pettycoat underneath? Thank you! I used McCall's 5431. I changed the waist from zipper to elastic, which is why it turned out a bit wonky the first time. I am wearing a petticoat. How many bat skirts does that make now? I distinctly remember at least two others, because I made one just like the first (green bats on a stiff material), and then you got the same material but softer, with lighter green (almost yellowy) bats. Thank you very much! It is me. I was having a bad head day. I love the shiny metal bits, but they are murder on lace. My newest New Rocks don't have any buckles, so maybe I'll get through next winter without shredding my skirts. Oh wow that fabric is amazing! Repairs always take me forever! I hate repairing, I'd rather make something new... Kodus for finishing stuff! 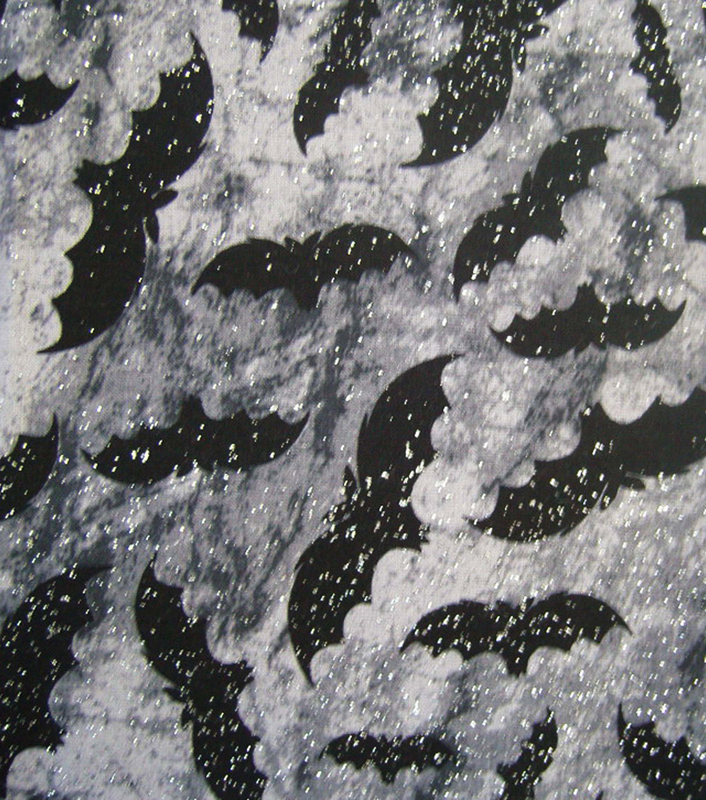 And the new skirt looks cute, I love the bats and the glitter! Me, too. I always procrastinate with repairs. Thank you! That outfit is amazing! We never seem to get the good fabric here!